The discovery of G2a is added to the finds from Treilles, Derenburg, and the Alps. It is now virtually certain that the Neolithic transition in much of Europe, both inland, and coastal involved G2a-bearing men. The discovery of E-V13 in Spain is unexpected on a number of different reasons: there is relatively little of it there now; it had previously been associated with the inland route of the spread of agriculture, as well as the spread of the Greeks to Sicily and Provence, or Roman soldiers at a much later date. While this Neolithic E-V13 may well have come from the Balkans, and the common ancestor of the very uniform present-day Balkan cluster may have lived after this Spanish find, it is now certain that E-V13 was established in Europe long before the Bronze Age. This highlights the need to avoid Y-STR based calculations on modern populations for inferring patterns of ancient history, and not to conflate TMRCAs with "dates of arrival": "In short: a particular TMRCA is consistent with either the arrival of the lineage long before and long after the TMRCA in a particular geographical area." At least for now, three of the major players of the European genetic landscape (E-V13, G2a, and I2a) have made their Neolithic appearance. Hopefully, as more ancient DNA is published, and even from later dates, more of them will turn up. I will comment more when I get to read the paper. For the six male samples, two complete and four partial Y-STRs haplotypes were obtained (Table 3). They allowed classification of individuals into two different haplogroups: G2a (individuals ave01, ave02, ave03, ave05, and ave06, which seem to share the same haplotype) and E1b1b1 (individual ave07). The four markers chosen to confirm belonging to these haplogroups (Y-E1b1b1-M35.1, Y-E1b1b1a1b-V13, Y-G2-M287, and Y-G2a-P15) were typed with a rate of 66%, which permitted confirmation that four males were G2a and one was E1b1b1a1b (Table 3). Analysis of shared haplotypes showed that the G2a haplotype found in ancient specimens is rare in current populations: its frequency is less than 0.3%(Table S3). The haplotype of individual ave07 is more frequent (2.44%), particularly in southeastern European populations (up to 7%). The Ave07 haplotype was also compared with current Eb1b1a2 haplotypes previously published (10–14). 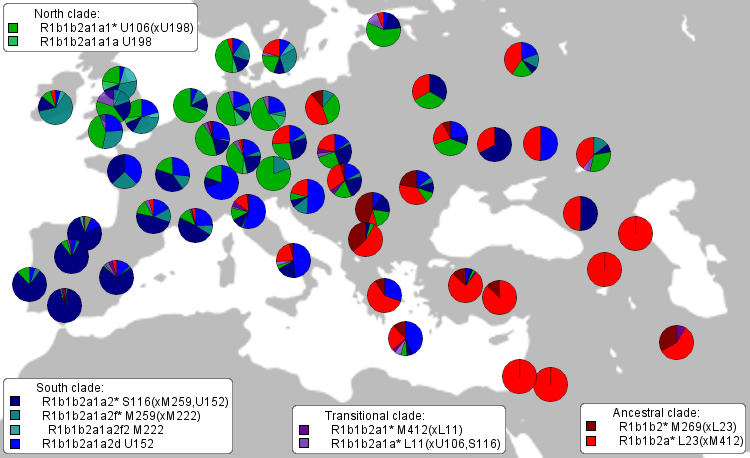 It appeared identical at the seven markers tested to five Albanian, two Bosnian, one Greek, one Italian, one Sicilian, two Corsican, and two Provence French samples and are thus placed on the same node of the E1b1b1a1b-V13 network as eastern, central, and western Mediterranean haplotypes (Fig. S1). The ancient remains all appeared to lack the common European lactase persistence genotype. Mitochondrial HVS-I sequences were obtained for the seven individuals and can be classified into four different haplotypes (Table 2). All are still frequent in current European populations (Table S1), and three of them were also found in ancient Neolithic samples (Table S2). These haplotypes permitted the determination that the individuals ave01, ave02, and ave06 belonged to K1a, ave04 and ave05 to T2b, ave03 to H3, and ave07 to U5 haplogroups. The supporting information (pdf) has a lot of additional information. What an amazing paper! Now we have Treilles Cave, LBK and Catalonia with dates from 6000 to 3000 BCE all showing G2a and no R1b. The V13 finding is a mystery. If real, then maybe V13 comes from an LBK context further north (Germany/Czech Republic etc...); if it is artifactual, then maybe some Provencal individual contaminated the samples. BTY, the evolutionary rate from ZUF attempts to get at the earliest appearance of a SNP, under the conditions of low or zero population growth--that's how it is modeled. It is not the TMRCA of contemporary samples which as Dienekes states will be more recent. ZUF attempts to renormalize mutation rates based on expected extinction events--namely the factor of 1/3. That doesn't mean it is right--only in the case of low population growth during most of the history/pre-history of a SNP. It is possible that G2a (given that R1b dominates Western Europe lineages today) did not have huge rates of demographic expansion during most of its history. If real, then maybe V13 comes from an LBK context further north (Germany/Czech Republic etc...); if it is artifactual, then maybe some Provencal individual contaminated the samples. I would definitely want to see some other Neolithic E-V13 turn up somewhere to be entirely convinced that it's real. But, why would it come from the LBK? If the Neolithic spread to Iberia by a maritime route, and the haplotype has links to Mediterranean populations, the easiest explanation is that it spread across the Mediterranean from the east, directly, and not via an LBK detour. BTY, the evolutionary rate from ZUF attempts to get at the earliest appearance of a SNP, under the conditions of low or zero population growth--that's how it is modeled. The 1/3 factor is applicable only in the case of zero population growth. Even modest population growth, of a few percent, changes the correction factor substantially, and I would say that the Neolithic, and the period after the last Ice Age before the onset of the Mesolithic are not periods of population stasis. In any case, I have argued too much about that point. I don't believe Y-STRs have any value anymore for inferring ancient population patterns. Thankfully, we have entered the age of ancient Y-chromosome studies in earnest. I don't believe Y-STRs have any value anymore for inferring ancient population patterns. Thankfully, we have entered the age of ancient Y-chromosome studies in earnest. Regardless of the difficulty in using modern Y-STR haplotypes to make inferences about genetic history, collections of such haplotypes still represent a very rich source of data. To be fair, the DNA results from these ancient remains would be VERY hard to put into any reasonable context if we didn't also have the massive number of modern Y-STR and Y-SNP haplotypes that we have enjoyed these past ten years or more. In my mind, we are not in an either/or situation. These ancient DNA results are extremely useful "in conjunction with" modern results, rather than "instead of modern results. These ancient results should help us refine our methods of analysis allowing us, for example, to reject procedures which predicted certain outcomes which - it turns out - are not compatible with ancient DNA results. These new results, for example, tell us that some Y-DNA lineages (e.g. R-M269) have undergone tremendous demographic growth in Europe during the last 7,000 years. Any analyis of modern haplotypes which does not incorporate that growth is, we now know, almost certainly in error. These data have validated our criticisms of the Zhiv evolutionary rate approach, I think, and open the door to more reasonable analysis. I didn't completely follow why Dienekes said, "This highlights the need to avoid Y-STR based calculations on modern populations for inferring patterns of ancient history,"
I just checked Marko Heinila's inter-clade TMRCA estimate for E-V12 and E-V13 and it came out to 7.2k ybp, which would be about right for a Neolithic expansion. I think you are in agreement with that possibility. What am I missing? The common ancestor of E-V12 and E-V13 lived before the founder of E-V13. So, unless E-V13's founder was born shortly thereafter, had a great number of descendants right away and one of them decided to sail for Spain, I'd say that odds are probably good that he lived quite a bit earlier than 7ka. Good points. Clearly using YSTRs for dating the arrival of G2a, V13 and R1b to NE Spain and SW France has failed us! The demographies are complex and unknowable at this time. V13 could definitely have arrived from the Mediterraean region to Catalonia; I suppose it is the most parsimonious route. It is, however, difficult to envision from where in the Balkans and/or Greece G2a might have comigrated with V13. It is still possible that G2a is a marker of the local Mesolithic population and that V13 tracks the Neolithic immigrants in this case. The presence of E-V13 is consistent with everything we know (and no, there's no chance it came from the North): E-V13 is common in Albania and coastal Albania (together with Montenegro, Dalmacia and later also most of Bosnia) is the ancestral source of Cardium Pottery Culture (in Wikipedia you may see Syria but it's a nonsense: Biblos Cardium-decorated pottery is more recent than Adriatic or even West Mediterranean one). Also CP has a precursor in Greece itself: the pottery of Otzaki is the oldest known example of Cardium style, even if most of that area is painted pottery (Sesklo style). E-V13, G2a, J and probably also I2a are to be considered Neolithic arrivals in SW Europe. I2a is original from the West Balcans surely but the rest all seem to stem from West Asia/Africa, albeit with Balcano-Italian jumping platforms. The only barrier is a mental, subjective, barrier: one of faith in certain ideas on how the molecular clock should be - that even after declaring the molecular clock "dead" it is haunting you guys is worrisome. I am just happy that more information about Haplogroup G2a is coming out finally....Thanks for sharing Dienekes. It is, however, difficult to envision from where in the Balkans and/or Greece G2a might have comigrated with V13. It is still possible that G2a is a marker of the local Mesolithic population and that V13 tracks the Neolithic immigrants in this case. G2a is quite common all around the Black Sea, so I see it as reasonable to assume it was present in the Balkans before the neolithic. But it appears more and more that the haplotypes people used to associate with migration from the Levant and Anatolia (E and J) don't show up. So, Cardium and LBK seem to have carried largely local Balkan/Middle Danube haplotypes, with few exceptions (like this E), and possibly further dilution at the fringes (we need data from there!). mtDNA also seems to support largely local origin. "It is, however, difficult to envision from where in the Balkans and/or Greece G2a might have comigrated with V13". Although they may have 'comigrated' to Catalonia they need not have originated in the same place as each other. "I'd say that odds are probably good that he lived quite a bit earlier than 7ka". And TMRCA can be way out of 'arrival' date if several members of an already-diversified lineage arrived. I don't know why people don't consider this third route seriously?! @PConroy: because today's North African gene pool does not include those lineages at any meaningful level (also archaeological reasons). E-V13, G2a and J2 (as well as I2a even if it's European by origin) show that pattern of expansion from the Balcans, through Italy and along the Danube. "I would definitely want to see some other Neolithic E-V13 turn up somewhere to be entirely convinced that it's real..."
Are you suggesting this find represents the only V13 who ever reached Iberia during the Neolithic? You say it proves that V13 was in "Europe" long before the Braonze age. I think it is more accurate and significant that these remains are proof positive V13 reached Iberia during the Neolithic, regardless of their numbers in relation to any other haplogroup. When I first got my result that I am Haplo-G I was halfway surprised, meanwhile I find it interesting to see all these G2a pockets around the Mediterranean. Given the fact that my relatives were originally scattered along the coastal regions of the Levant. But unless you're going to make the case that North Africa was somehow exceptional, then shouldn't we expect population replacement? If Europe had a large G2a population in the Neolithic, and today has 0.3% G2a - or barely a trace! Then couldn't we expect that if North Africa had a lot of R1b, that today there would be a trace - and that is in fact what we find?! I don't expect population replacement by default (unlike so many, it seems), I have to be persuaded of it. In the case of North Africa I do think that there may have been partial (male mostly) population replacement but this one was pre-Neolithic (Capsian culture) and lead to something very similar to the modern genetic pool (save lesser details surely). Both archaeology and genetics lead me to think that the genetics of North Africa were roughly those of today when Neolithic tech traveled through the Med. Anyhow, North Africa, excepted a few coastal spots, which may (or not) be at the origin of West Iberian E1b-M81, is outside the Cardium-Impressed Pottery context. E-V13 could have hypothetically been cro-magnon. That said, neolithic settlements were not necessarily representative of all inhabitants of country X. The contemporary hunter-gatherers might be something completely different such as R1b. However, it is interesting how not a single man from these lineages has showed up yet. How did hunter-gatherers or non-city dwellers live and how did they bury(burn?) their dead are questions I would ask. What are the chances of yielding results from these kinds of remains? But did it, and does it? So far, we only have neolithic data from select spots - while we know that the initial neolithic was quite thinly settled. We also know for sure that there were hunter-gatherers and settled fishing people intermixed with them at the fringes (for certainty in the north: Belgium, Netherlands, northern Germany, Scandinavia, Baltics) - so likely also elsewhere. We have pretty much zero y-DNA data on these folks. Conversely, in the core of Cardium and LBK migrations, say NW Balkans, along the Danube, in the Alps, and along the coastal eastern Mediterranean today's G2a concentration is not minuscule - it is in the 5% - 10% range, even higher in some pockets. In North Africa, "shouldn't we expect population replacement?" We have ancient mtDNA from 12,000 years ago in North Africa that is generally similar to modern populations, discounting that possibility. The chances of getting 100% "immigrant" lineages (or 75% if we consider I2a to be "aboriginal") out of 4 (all the rest were obviously close paternal relatives such as brothers, sons, etc.) in SW Europe are high enough. That does not mean I don't share your perplexity, specially at the high frequency of G2a... but the chances of it being a fluke are still high. G2a+I2a+E-V13 make up today some 15% of the Iberian Y-DNA pool (and I presume that similar amounts in Languedoc, with small variation). All non-R1b lineages amount to 35%. We need a sample at least five times more extensive. We faced the same issues with Danubian mtDNA initially: all that unexpected N1a!, which in the end is just 14% (7/50)... What we needed was just larger more comprehensive samples. I may be wrong but I'm willing to give the matter several more years of archaeo-genetic work to see results that make some sense: if you throw a dice there is some quite high likelihood that all four first throws are 5-6 (roughly equivalent to the non-R1b pool) but as you throw more and more the chances of any such fluke decrease quickly. The chances of G2a specifically are however much lower even in all Europe. It makes one wonder about what are the chances of PCR contamination, an issue that was raised in the past (the provider may be the same for all research teams). Otherwise it'd be quite clear that the Neolithic colonists quite radically failed to make the major impact that all of us more or less expected and either shrunk or were never as numerous as their sites may suggest us. Re. cremation: it leaves remains (burnt bone fragments for example, not to mention the tomb markers), only a Hadza (or Parsi) type of funeral (leaving the corpse to the animals) leaves no remain. Whatever the case the aboriginal peoples did traditionally bury their dead much like we do now, in extended position (while farmers often buried them in fetal position), typically with ochre offerings (a practice attested in most of East Europe until Chalcolithic). The human remains of that period are sparse however, what suggests that we have not located but a tiny sample of burials. One issues is to see processes as lineal: Epipaleolithic A happened before Epipaleolithic B, which happened before Neolithic A, etc. This is correct in the general outline but they surely overlapped as well. In fact in parts of Iberia (Andalusia for example) we find Epipaleolithic A (micro-laminar, similar to Azilian) tools in Neolithic contexts. Whatever the case it is clear that now the challenge is to test the Y-DNA of Upper Paleolithic or Epipaleolithic peoples, as well as extending the Neolithic sample. Actually the likelihood is only 1%. However, neither specific male lineages nor archaeological work is spatially non-random, so a cautious approach makes sense. These data suggest to me that G2a overran Europe during the Neolithic. Others have argued that G2a spread from the Caucasus based on the branches and regional diversity of G. The absence of R1b suggests that R1b later overran Europe and replaced/ diluted the earlier Neolithic lineages. Again the branches and diversity of R1b suggest that it spread from the Near East. ii) Neolithic - looks like G2a. iii) Later Neolithic/ Bronze Age - R1b. But what about E and J? Maybe G and/ or R mixed with E and/ or J before they expanded across Europe -- which need not preclude other E/ J waves and trickles. "... the branches and diversity of R1b suggest that it spread from the Near East". That is not acceptable anymore unless you are talking of ALL R1b and not the European-Anatolian subclade R1b2a2 (formerly R1b2b2, M269 in any case). In 2010 we were lucky enough to get a couple of very revealing papers on the structure of this major haplogroup. One by Morelli showed quite clearly that the origin of R1b2a2-M269 is in the Balcans and not West Asia. West Asia is a destination and probably 99% of R1b there makes up a yet unnamed distinct sub-haplogroup, parallel to that dominant in Europe: R1b1a2a1a-L51/M412. ·R1b1a2a1a1b (P312/S116), the main haplogroup by far in numbers, with a clear diversity center in SW Europe (but extensions to the North and Italy as well). You can probably appreciate it best in this map (nomenclature from 2010) or (with less detail but more intuitively) in this other map. 1. The origin areas, notably Portugal, are not particularly outstanding in the lineage. 2. The Northern clade R1b1a2a1a1a-U106 can hardly be explained this way (??). 3. The highest basal diversity of the Southern clade R1b1a2a1a1b-S116 is probably in South France and around the Pyrenees, where all non-private sub-haplogroups exist (though this matter still needs clarification, so much "asterisk" there is yet unresearched). There's no Bronze Age mechanism that could explain all that either. IF we are to accept a Neolithic expansion for European R1b1a2a1a-L51, then we have almost unavoidably to think in terms of Megalithism. But a Paleolthic explanation is much better. Note: for haplotype diversity, you may be interested in this compilation by Argiedude, discerning between the Anatolian and European clades. "These data suggest to me that G2a overran Europe during the Neolithic". To me that seems the most likely scenario as well. "The absence of R1b suggests that R1b later overran Europe and replaced/ diluted the earlier Neolithic lineages. Again the branches and diversity of R1b suggest that it spread from the Near East". The problem with that idea is that R1b in Europe is especially common at the western extremity. This suggests to me that it is a long-term survivor there. It has been replaced through much of the rest of Europe by later expansions from further east. "But a Paleolthic explanation is much better". I agree with Maju here. "The problem with that idea is that R1b in Europe is especially common at the western extremity. This suggests to me that it is a long-term survivor there. " Among all the lines of evidence, haplogroup frequency in a location is one of the least reliable indicators of ancientness in that location. Although there is still room to quibble about some of the finer points, multiple lines of evidence suggest that there can be little doubt that R-M269 is a relatively recent (e.g post-Mesolithic) arrival in Europe from the direction of SW Asia and not - as in the old orhtodoxy - a Mesolithic remnant of European origin. Not sure if it's a less or more reliable indicator, Vincent. Last time I said that (in regard to another haplogroup) I had to swallow my words because at least in that case frequency and basal haplogroup diversity were coincident. In the case of European R1b it is also coincident but not as a whole R1b or as R1b2a but only at the levels of R1b1a2a1a-M412, R1b1a2a1a1-L11 and, very specially at the levels of R1b1a2a1a1a-U106 (North clade) and R1b1a2a1a1b-S116 (South clade). This is unquestionable: the South clade (S116) is by far the largest sublineage in R1b and has greatest diversity in SW Europe (my impression is that around the Pyrenees, though the matter needs some more research), the North clade (U106) is the second largest and has greatest frequency in the Netherlands and diversity must not be far away either. Also the Anatolian R1b appears to be (99%) a distinct haplogroup, monophyletic in any case, yet to be described properly, and not really the pool of infinite diversity some have claimed. Minor back-migrants from Europe do add to that apparent diversity however but the haplotypes are almost invariably derived from European ones. So we can well say that raw STR diversity in a location is not at all any definite evidence of origin. Careful research and qualification is required before we can jump to any conclusions. Maju, I would not go so far as to say that high frequency NEVER indicates longevity of presence. But of a the available indicators, frequency alone is undoubtedly one of the least predictive and is (under some rather common conditions) often a contraindicator. In fact, how the various indicators line up can tell us a lot about the history of a haplogroup may have spread. A clade in which frequency and variance peaks are coincident, for example, can clearly be inferred to have a history quite unlike a clade whose peaks are widely divergent. 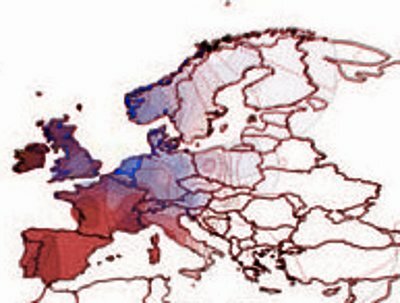 "how the various indicators line up can tell us a lot about the history of a haplogroup may have spread". From that it would appear that this haplogroup must be the first to have arrived in Ireland, Scotland and the Pyrenees. Ireland seems to have been first occupied around 10,000 years ago. So, presumably, at least the immediate ancestor of R1b1a2a1a1b4-L2 must be at least that age in Western Europe. Unless any 'original' haplogroup in Ireland has been later replaced by that haplogroup. What I am saying is that this, R1b1a2a1a1b-S116, is the case: frequency and basal haplogroup variance cluster in the same area. The detail is yet a bit rough for lack of research but I understand that this area is probably coincident with the Franco-Cantabrian region, which hosted most Europeans in the Upper Paleolithic. R1b1a2a1a1b-S116 is the largest subclade by far with R1b, including only in Europe (I estimate), maybe 100,000 million members. It's twin clade, R1b1a2a1a1b-U106, must also be very large (50 million?) and again has its highest diversity peak towards the Atlantic, just that further North. The problem, your problem, Balaresque's problem... is looking at the wrong layer of R1b: what you do is not essentially different to looking at the diversity of macro-haplogroup F and, based only on that, attempting to explain G2a, for example. Brain surgery with a felling axe? No, thanks. I have looked at this for several years now, and the only "evidence" I have been able to find that R1b is recent in Europe (neolithic or earlier) is from (mostly) amateur "calculations/estimations" that get the timing consistently wrong by a factor of 3 or so (I have actually tested this on recently found ancient DNA, on several occasions). So, no - IMO, factual evidence is that R-M269 consists of two very distinct subgroups in most of Europe versus Anatolia, with the progenitor documented in the Balkans, with a highly unlikely spread in Anatolia during the neolithic with known, dominating other haplogroups during that time (thus, earlier) - all pointing to a paleolithic origin. "What I am saying is that this, R1b1a2a1a1b-S116, is the case: frequency and basal haplogroup variance cluster in the same area." As I said already, I acknowledge that sometimes it happens that haplogroup frequency and STR variance peak in the same location (though that doesn't happen to be the case in R-P312, as you appear to be suggesting). When it does, the coincidence of the two peaks is - indeed - informative. But of the two measures (frequency and STR diversity), frequency is the less reliable. When frequency peaks at point A but diversity peaks at point B, you should bet on B as being closer to the point of origin if you know nothing else. If you have more lines of evidence, then of course you weight them all - putting due weight on the reliability of each. "I have looked at this for several years now, and the only "evidence" I have been able to find that R1b is recent in Europe (neolithic or earlier) is from (mostly) amateur "calculations/estimations" that get the timing consistently wrong by a factor of 3 or so (I have actually tested this on recently found ancient DNA, on several occasions)." If you are being sincere, then I think you haven't been looking very hard. There have been a host of of papers in academic journals and monographs during the past "several years" which lay out the evidence for a post-Paleolithic entrance of R1b into Europe from SW Asia. There are certainly papers which dispute that evidence as well, but an impartial analysis will reveal the former set of papers to be superior in quality to the later. And if you think there is anything "amateur" about the quality of population genetics research coming out of independent scholars in the past five years or so then clearly you haven't been paying attention. Clearly there is some variance in quality, but that is true in academic circles too (the papers by Morelli et al. are laughably bad, for example). But I would have no trouble naming ten "amateur" population geneticists who could embarrass the vast majority of academic geneticists on the topics of Y-STR behavior, TMRCA estimation technique, phylogentics, demography, or details of R1b more generally. I'm not even discussing STR variance, Vincent, but only subhaplogroup variance. I doubt that there is any STR variance study on R1b1a2a1a1b-S116 specifically. All STR variance studies are about R1b without qualifications or, at best, R1b1a. All known subhaplogroups worth that name (non-private) are found in Southern France (and/or among Basques, Catalans, etc.) No other region fulfills this condition at the current state of knowledge. Additionally R1b1a2a1a1b*, which is still most of the haplogroup is concentrated in SW Europe, from the Loire to Portugal. I can't believe that you have not looked at all this and pondered what it means. Or rather, I can believe but it's lamentable. As you bring the issue, I must say that the only recent relevant paper I have made a demolishing criticism is that of Balaresque, which is so extremely biased that, besides the raw data, it is unforgivable. Sadly it is also the paper that has attracted most media and even bloggers' attention out of "Neolithicist" wishful thinking. A waste of time and energies for all us but a great example of bad research where the preconceptions totally distort the the methods and results, until they render the work worse than just useless but a ill-willed misdirection of science. I'm not even discussing STR variance, Vincent, but only subhaplogroup variance. Apparently you don't mean variance at all, but rather some sort of diversity measure. But absent any serious effort to quantify that measure, there doesn't seem to be any productive way to discuss it further. Except to say that the only way to concoct a story about R1b being of paleolithic European origin is to ignore vast quantities of data and misrepresent that data which are not ignore. Balaresque is a solid paper: it may not be perfect, but it is far superior to most published population genetics papers by a long shot. I'm missing my last comment which was a correction to my previous post. I hope it is an error an not some sort of not-so-subtle censorship. This is just a straight count but should be quite clarifying on its own. Argiedude made a more systematic estimate of variance from Balaresque's and other papers soon after that (which appeared in a discussion in this blog and was soon after published in my old blog as well upon his request with a nice illustrative double map). As for what you say, Vincent, you are obviously hiding behind shutters of prejudice and blind faith. Your STR 'variance' (which is not real, as explained here) is in no way better than my haplogroup basal diversity. Haplogroup phylogeny (SNP-based) has ALWAYS preeminence over STR-based haplotypes. (I'm keeping a copy of this just in case the comment doesn't make it in). Learn how to use a computer before you launch accusations of censorship. And, if you insist on such accusations without evidence, be assured that you _will_ be banned. "Except to say that the only way to concoct a story about R1b being of paleolithic European origin is to ignore vast quantities of data and misrepresent that data which are not ignore". But any claim to a later arrival has to explain how the haplogroup managed to become virtually the only one at the western extremity while leaving virtually no descendants along any possible route there. Surely it is far more likely to be an older haplogroup which has been replaced by later migrations into Europe from further east. Ok, I believe you, Dienekes. My apologies (not because I fear banishment but because I don't like to make false accusations). However I'm fairly certain that my post went through and I got a message of the kind "your message has been saved and will be visible after blog owner's approval". So my best guess is that it went automatically to that annoying "spam" folder Blogger devised to drive us crazy. It happens often for no apparent reason and I also get complains for that. I presume you know how to check it but, just in case, it is: Design -> Comments -> Spam. There is nothing in the spam folder. You may have posted it in the wrong post. We just learned that my mother's maternal grandfather was G2a3b1a1. His name was Rodriguez and his family had been in Chihuahua, Mexico since the 1500s. Before that, they were from Spain. I am particularly interested in the G2a3b1a1 haplogroup and am writing to request any information you may have that is specific to it. Thank you. I am a G2a haplotype and I have had a tendancy to lead all my life whether it was sports or music ...I'm wondering if this is some trait I've inherited from my ancestors. My intuition is always right on the money and I usually have a clear vision to the order of things. I have never posted a comment but am a avid reader on these posts dealing with haplogroup E-V13. I have invested interest in this haplogroup due to being one of them who tested to be E-V13. I find it some what insulting that its hard for you all to believe this haplogroup was founded in earlier site than you all thought it would be and DNA evidence prove it to be older than you thought. I feel this haplogroup is older than you may know. The haplogroup E-V13, I feel is 14k to 17k years old. I feel that R1B is recent addition to Euro a late addition coming from Russian region and during the Roman era moved out. I feel that halogroup I, G and E-V13 is aboriginal to Europe and is the founders of Europe. One other comment I would like to make. If you took a genetic snap shot of USA today. You would assume that the majority haplogroup was the indigenous people and that the native Americans who founded the Americas was a recent migration into the Americas. This is the type of science we are talking here being done today! what needs to be looked at is ancient sites and culture and through strata of time see the divergent change of peoples and or testing of bones from said strata to understand present day haplogroups and there migrations. I also would like to add while its interesting the migrations of people and who we become through time, we are all from Africa are we not? No matter how far the haplogroups diverge or change we are all shades of Africans. I read many posts and see how many people try to distance themselves from there African roots. They state oh this group has more black in them or this group is more pure. I find that this DNA has caused more of a problem than a blessing. How be it I like what I learned from my test on both side of my family, it was insetting what I learned on my genetic journey. I do keep in mind that where it all started was Africa. It is my earnest belief that the human mind has a tendency to view things positivistically. As a consequence, it misunderstands how genes and haplogroups wind up in particular places. The e-v13 clade and some other related groups are thus misunderstood in their origins and their histories. The cluster of ev13 in the Balkans, like the South of Italy (being a bit higher than the north but not that much) does not represent an entrance point from which the group spread, but a resolution to where the group was pushed. Ev13 has been in Europe a long time. It was stuffed in the south by successive conquests from the North. Think of the entirety of European history. The Balkans is just the resting place of a group bullied into a corner. As E is present in the Welsh and Irish but not where the Angles and Saxons laid claim. The type is quite ancient though existing especially in the central Slavs (Hungarian, Slovakian) and South Germans (Suabian, Austrian, Bohemian, Swiss, Bavarian) who came into contact with the native peoples they were conquering. "Ev13 has been in Europe a long time. It was stuffed in the south by successive conquests from the North". It is difficult to make an effective case for that. E-V13 is just one branch within E-M78. Most other branches within E-M78 are African and so it is very likely that E-V13 coalesced from an E-M78 that arrived in the Balkans from Africa rather than it being a remnant of a more widespread E haplogroup. I do not think that's what the map demonstrates. The map demonstrates areas less dominated, less touched by R1b and R1a. In other words, when you look where the Es tend to cluster in Europe, Northwest Spain, the Southeast, in the Balkans, Southern Italy, and so on, it takes on the pattern of a preexisting group pushed to the periphery, but invading Northerners. What I am pointing out is a dualism. You see a clinal relationship and you think that a group spread from a hotspot, but that's really more likely an illusion in this case. The group is not disseminating from a point but dissipating toward one. The group didn't spread. It was already fairly scattered ten thousand years ago around the Mediterranean (supported by the find in Spain) and perhaps even central Europe, parts of Gaul, Celtic areas perhaps. The regions that went untouched by Northern invasions remained at a higher frequency. Otherwise why the higher numbers in Northwest France and Spain? Perhaps these people were hopping to different parts of the continent and spreading out for multiple loci? Not very likely. Expect E1b1b to be more frequent where conquering peoples were less likely to arrive. If Northerners arrived via the Pyrenees, expect that they may have headed South and west and left the Northwest less tampered with, as they left Northwest France (Brittany) less tampered with, and the mountainous and Remote regions of the Balkans and Greece less tampered with. This also fits the historical record in Europe. The same clinal relationship exists I am sure in Britain. The East is most unrepresented by E not because E spread from Wales towards Anglia, but because the Angles spread from the East to the West. But again the map can represent "spread" or "dissipation". My guess is dissipation. It has that look to me. Ten or fifteen thousands years ago, with minimal competition, or with superior technology perhaps, a group could have successfully dispersed itself around the continent, before being pushed back by successive waves of others with superior gifts of sorts, from the North. Not at all implausible. "when you look where the Es tend to cluster in Europe, Northwest Spain, the Southeast, in the Balkans, Southern Italy, and so on, it takes on the pattern of a preexisting group pushed to the periphery, but invading Northerners". "Within E-M35, there are striking parallels between two haplogroups, E-V68 and E-V257. Both contain a lineage which has been frequently observed in Africa (E-M78 and E-M81, respectively) and a group of undifferentiated chromosomes that are mostly found in southern Europe. An expansion of E-M35 carriers, possibly from the Middle East as proposed by other authors, and split into two branches separated by the geographic barrier of the Mediterranean Sea, would explain this geographic pattern. However, the absence of E-V68* and E-V257* in the Middle East makes a maritime spread between northern Africa and southern Europe a more plausible hypothesis. "The group didn't spread. It was already fairly scattered ten thousand years ago around the Mediterranean (supported by the find in Spain) and perhaps even central Europe, parts of Gaul, Celtic areas perhaps". I don't think that is likely. The European haplogroups are all downstream haplogroups, not basal. They share immediate ancestors with Africa. "Otherwise why the higher numbers in Northwest France and Spain?" People capable of travelling round the Mediterranean by boat would soon learn how to conquer the coastal regions of the Atlantic. "Perhaps these people were hopping to different parts of the continent and spreading out for multiple loci? Not very likely". I think that is exactly what they were doing. "If Northerners arrived via the Pyrenees, expect that they may have headed South and west and left the Northwest less tampered with, as they left Northwest France (Brittany) less tampered with, and the mountainous and Remote regions of the Balkans and Greece less tampered with. This also fits the historical record in Europe". "For example Battaglia et al. (2007) estimated that E-M78 ('E1b1b1a1' in that paper) has been in Europe longer than 10,000 years. And more recently, human remains excavated in a Spanish funeral cave dating from approximately 7000 years ago were shown to be in this haplogroup". Ten thousand years is very close to the date now given for human arrival in various Mediterranean islands. "Ten or fifteen thousands years ago, with minimal competition, or with superior technology perhaps, a group could have successfully dispersed itself around the continent, before being pushed back by successive waves of others with superior gifts of sorts, from the North. Not at all implausible". Certainly not, but I think the bulk of evidence is against it. What does "The four markers chosen to confirm belonging to these haplogroups were typed with a rate of 66%..." mean? I see that one E sample had to be disregarded, and on ave07 it was a problem at the Y DNA, something is bold in Table 3. Why did they have to compare it with todays Albanian and Bosnians, etc. Why do they mention some predictor software in the article? Is this 100 % true or not?